Jarel Zhang debuted his first ever New York Fashion Week collection this evening on site with IMG at NYFW: The Shows. 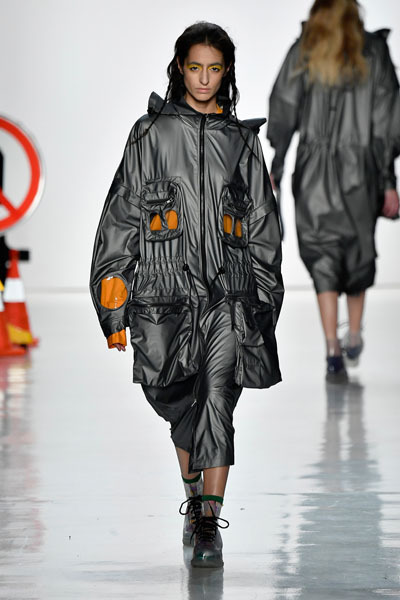 His astounding collection of reworked anoraks proved the designer is one to watch in coming seasons. Guests were guided through a faux construction site replicating their SS18 lookbook— each attendee received at their seat– photoshoot location. Jarel Zhang’s custom stop signs and lit traffic cones lined the packed sections of celebrities, media, buyers, influencers and industry members. Transporting guests to a land the designer calls “Beauty in the Chaos” was the ultimate goal. With the theme very much achieved, Jarel Zhang channeled his craftsman nature to create material manipulation unlike any predecessor. 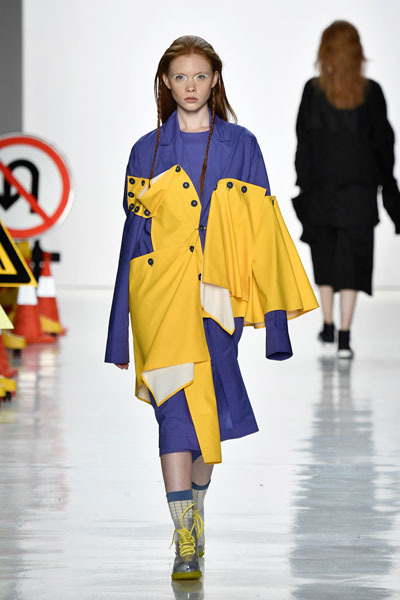 The collection consisted primarily of reworked anoraks in a variety bold hues and silhouettes. Intricate pleating work and strategically placed zip pockets gave the collection an elevated casual, yet edgy persona. Provocatively combining unexpected colors, Jarel Zhang made guests fall head over heels for eggplant and yellow and fuchsia and red combinations. Each piece spoke for itself with the incredible detail work apparent on every garment. Jarel Zhang drew inspiration from the chaos, construction, and movement of the New York Streets. He found beauty in the chaos and the structural elements of this great city. His edgy pieces struck guests with awe-inspiring talent who can’t wait to see what’s next from this fresh designer. Notable attendees included Annie Q of The Leftovers, Francesca Curran of OITNB, Miss Universe Iris Mittenaere, Miss USA Kara McCullough, Real Housewife Cary Deuber, Danielle Moinet and Ashlee Keating.